Welcome to the Residence Inn Abilene TX hotel! We are an all-suite, state-of-the-art hotel offering separate living, dining, and sleeping areas for your comfort and convenience. 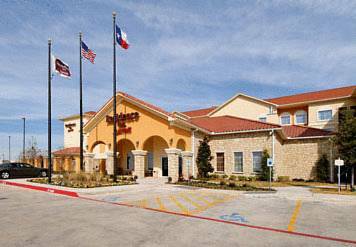 This hotel in Abilene TX is only 4 miles from downtown Abilene and the Abilene Regional Airport. Conveniently access the area's top attractions such as the Abilene Zoo, Abilene Christian University, McMurry University, Mall of Abilene and the Dyess Air Force Base from our Abilene hotel. Start your day with a complimentary, hot breakfast buffet or unwind after a long day at our evening hospitality receptions Monday - Wednesday. Our Abilene hotel also offers a relaxing outdoor pool area and BBQ pit in our grilling pavilion. Each Abilene hotel suite offers separate living and sleeping areas, fully equipped kitchens and 32 inch flat screen TVs. Cozy up in front of the lobby fireplace or get some work done with free high speed internet. Experience our world-class Marriott hospitality at the Residence Inn Abilene, Texas hotel today.